Purely vegetarian food is prepared during Navratri festival for devotees. Explore best Navratri recipes or vrat recipes to be made and served during Navratri. Navratri Recipes - Navratri festival is as much about fasting as about maintaining a strict vegetarian diet. However, over time, the ritual of breaking the fast with a meal has taken a new turn. While milk and milk products and fruits are consumed throughout the nine day fasting period, wheat and vegetables form the staple of Navratri food. Navratri cuisine has evolved to include a great variety of dishes which are known for their appetizing taste as for their 'sattvik' quality. Most people who observe fast during Navratri stick to a regimen of one meal a day. These Navratri recipes are prepared with only pure ingredients such as rock salt, root vegetables like potatoes and colocasia or 'arbi'. 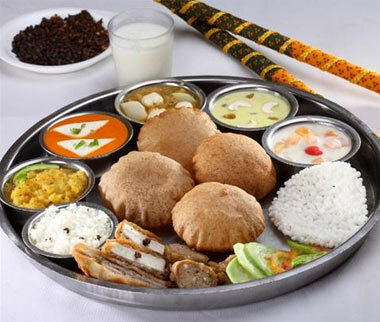 The 'vrat ka khana' during Navratri comprises delectable snacks like mathis and fries as well as sumptuous curries. While spices such as red chillies, cumin and turmeric powder are allowed, most of these dishes are delicately spiced. It is a common practice to use 'sendha namak' (rock salt) as common salt cannot be used. Some of the most popular Navratri recipes are 'Sabudana khichdi,' 'Sabudana Vada', 'Singhaade ke Pakode', 'Singhaade ka Halwa', 'Kuttu ki Puri', 'kuttu Pakoda', 'Fried Arbi', 'Potato Fries, 'Kacche kele ke Kofte' and 'Coconut laddoos'. 'Singhare ka atta' is a versatile ingredient that lends itself to several Navratri food preparations such as puris, pakoda, matthi and burfee. Singhare Ka Halwa is an extremely popular sweet dish garnished with dry fruits. A staple in a Navratri 'thali' and is complemented by curd or boondi raita. This is a crunchy snack prepared with tapioca pearls and potatoes. 'Sabudana vada' is a great option as a filling snack during Navratri fast. This is a popular dry preparation made with balls made of raw bananas. A tasty quick-to-prepare recipe made with boiled tapioca and potatoes, it is enjoyed even by those not observing the fast. Also served as 'prasad', kale channe is a dry spicy preparation which can be had singly or with puris. This vegetable dish is prepared using the goodness of gourd which keeps the body cool. This is a slightly tangy preparation prepared using lemon and green chillies. A simple curry recipe that is perfect for a healthy meal for those observing Navratri fast. Samvat is a type of rice fried in ghee. This is a mouth-watering sweet dish made with makhana (foxnuts) and dry fruits. This is a sweet dish that has 'swang', a type of rice as the main ingredient. A great accompaniment, dahi raita is made with curd and boondi made of besan. This is a puri made with stuffing of dal, which makes it very filling as a Navratri meal. Besides the above, there are a multitude of recipes churned out in households where Navratri is observed every year. Some major Indian desserts such as 'payesh', 'sweet potato pudding' and 'lauki ki kheer' are regularly prepared during the nine days of fasting. Special homemade recipes for healthy drinks include 'thandai', 'badam milk', 'sweet lassi' and fruit juice concoctions. Also, at this time of the year, restaurants come up with special Navratri menus. The Navratri platters comprise an assortment of snacks and savories.